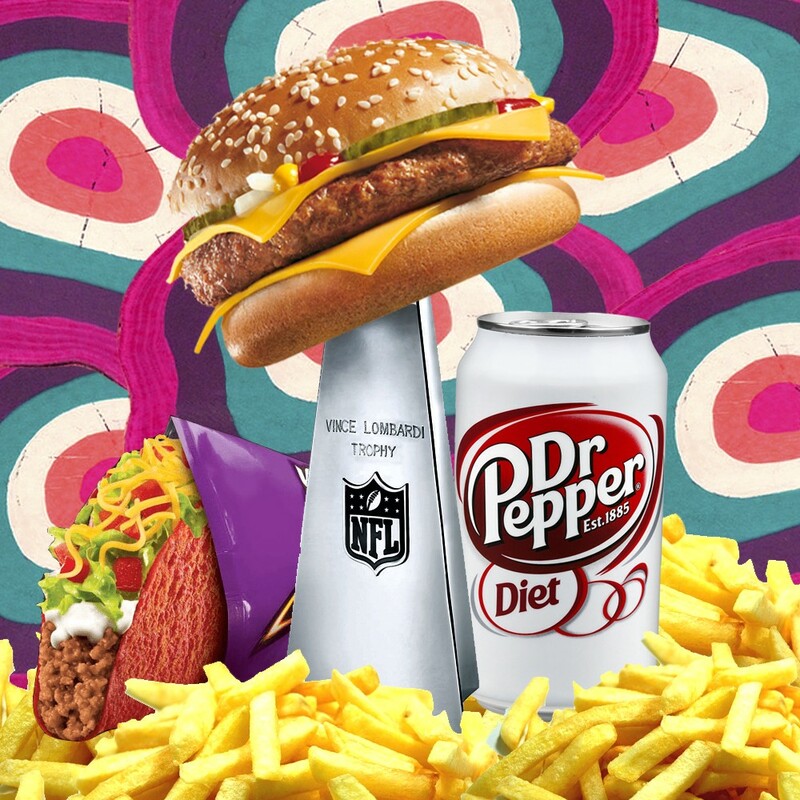 Over the course of a single week, I ate all 62 of the fast-food meals advertised during the playoffs. 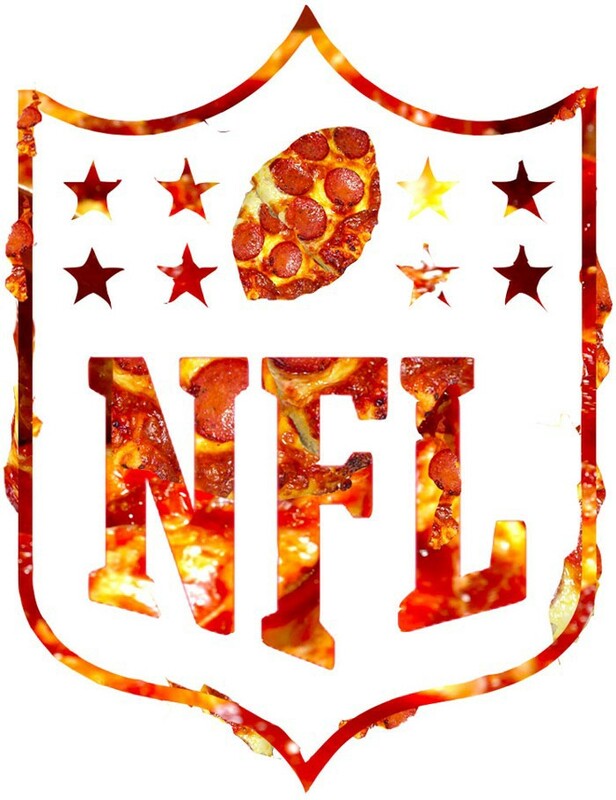 If you watch football even a little bit, you know the NFL is trying to sell you some garbage. I don’t mean the violence or the corruption; I mean the garbage people voluntarily line up for at breakfast, lunch, and dinner every day. 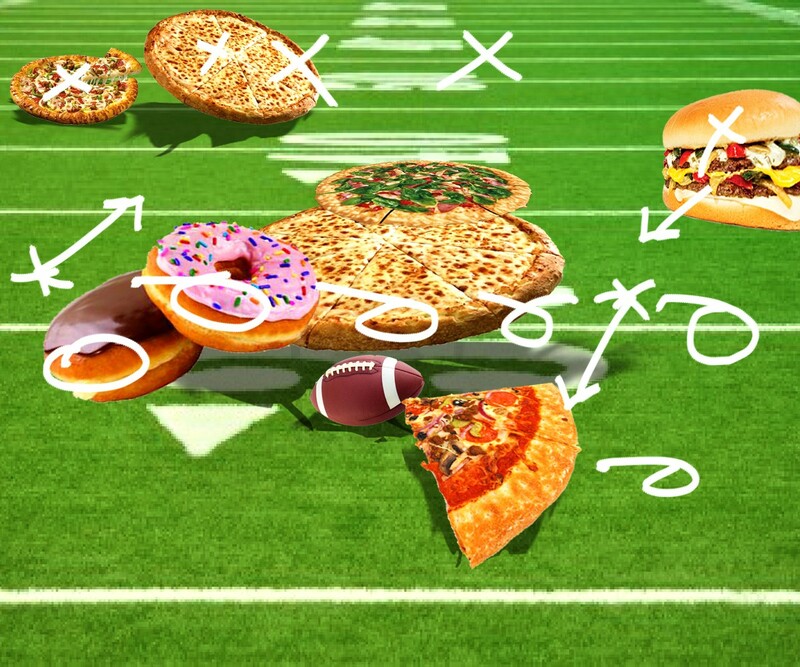 From September through January, chain restaurants hand over hundreds of thousands of dollars to networks — which, in turn, hand over billions of dollars to the National Football League — all for the privilege of trumpeting the latest innovations in processed cheese and chemically treated meat. And every Sunday, I sit on a bar stool or a couch, and watch, partly disgusted, partly intrigued, almost always hungry. How much food is that really, I wonder. Is combining a soft pretzel with a pizza a great idea or the best idea? Over the course of 10 playoff games, I set out to answer these questions, tracking ads and hunting down food (you should see my spreadsheet). By my count, there were 49 commercials, aired around 200 times, advertising 62 products or meal deals. I ate them all. 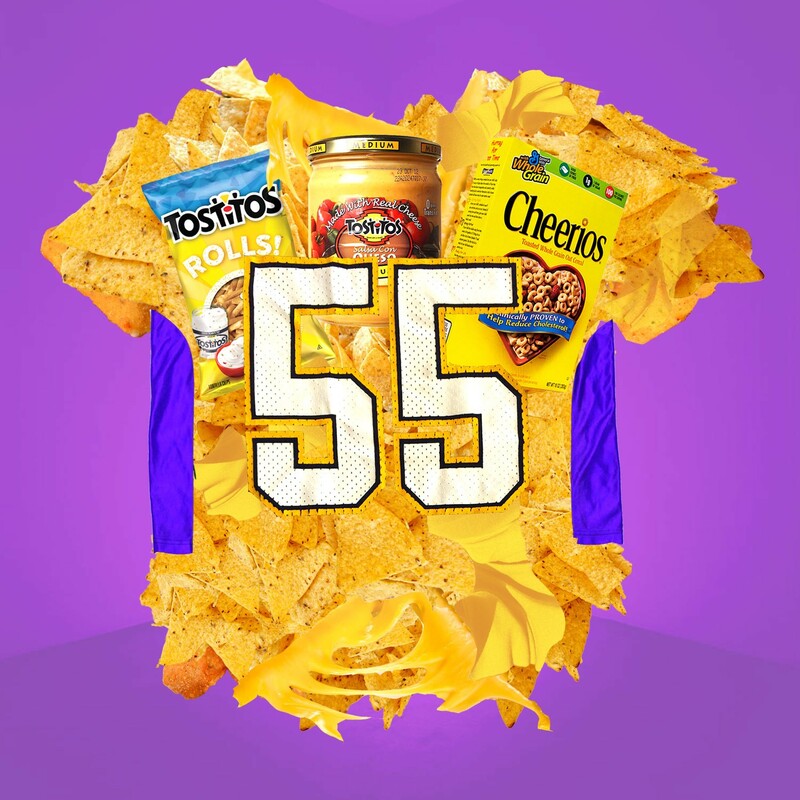 This is a week on the NFL diet. File under things you know without knowing: Sad-looking white men love dining alone at Subway. Thanks, Jared! Today, the late-lunch crowd includes three dudes with graying hair, respectable paunches, and cell phone holsters; two apparently bored cops; and me. Everyone has ordered “the usual” or a cookie and a drink. I stumble through my custom instructions for the sweet onion chicken teriyaki like I didn’t voluntarily patronize this establishment on the regular in the mid-2000s. “I can choose any chips?” I ask, slightly fearful that only baked ones are covered by this meal deal. “Any chips.” Lattice-cut aged cheddar and black pepper it is. It’s too late for me to drink caffeine, so I opt for pink lemonade and settle in with my lunch. Like most people who’ve experimented with an eating disorder, I am well acquainted with Subway’s argument that boneless skinless chicken breasts have redeeming qualities. I abandoned that concept around the same time I stopped eating here. On this sandwich, the chicken strips mostly serve as a vehicle for Italian dressing (aka sweet onion sauce), and both are pretty much lost inside the signature oversize floppy roll. I’d wanted the pure Subway experience, so I’d requested hot peppers on the side, but the pure Subway experience turns out to be overly soft bread that tastes prominently of dust. After a few bites, I relent and add the peppers. The whole thing is instantly a hundred times more edible. Six inches of sandwich down, an entire world of terrible food to go. This commercial is clearly ripped from the brains of the adorable baby geniuses behind Push for Pizza, but theft or not, I laugh every time I watch it. I download the Domino’s app and enable voice ordering. “What can I get you?” Dom asks. “Pizza,” I say. This is going great! But then Dom asks for more details — What kind of pizza? What do I want on it? Who hurt me? — and Dom keeps not understanding my answers. I flash back to a night in college when I tried to order a pizza during a blizzard while stoned. I sat on hold for 20 minutes, and when someone finally got on the phone I started giggling so hard at the word pizza that they hung up on me. I turn off voice ordering. Here is what I learn from eating Domino’s sober: It is much more delicious when you are drunk. I drink my Coors Light as fast as I can, but all that does is prove that the Monty Python joke about making love in a canoe holds up. The pizza stays bland, the unsatisfying kind of greasy, and the crust tastes like a bakery roll. I scale back my ambition from half of each pizza to two slices of each, all of which I cover in oregano and red pepper flakes. I go to bed feeling full but normal and wondering when I’m going to have to eat something truly foul. Pizza is my favorite breakfast food. Morning-after Domino’s is better than night-of Domino’s and on par with the toaster pizzas I keep in my freezer for hangovers. There’s not a lot of ways you can go off script at a fast food joint, but ordering a Yumbo, 10 chicken nuggets, and nothing else still apparently warrants a side eye from the cashier. “Are you sure you want that?” she asks. My friend told me a story once about waiting on line at Chipotle behind a guy who requested a bowl of meat with sour cream. The server kept trying to convince him to add other items until finally the customer said, “I think I’ve made myself clear.” You never think you’re going to be that guy, until one day you’re that guy. Burger King has been pushing its 10 Chicken Nuggets for $1.49 limited-time offer hard, and my fingers are crossed that it’s some type of loss leader and not a price point with a healthy profit margin. After eating them, I’m not totally sure. It’s not that they’re terrible, just that they’re a couple rungs down from generic frozen nuggets from the grocery store: bready, lukewarm, and not wholly recognizable as poultry. Still, I demolish all of them in about two minutes. All hail dipping sauces, I guess. The Yumbo requires more mental preparation. I’m not wild about deli ham under the best of circumstances, so the fact that this hot ham-and-cheese sandwich was cut from the Burger King menu 40 years ago and this is its first revival isn’t inspiring confidence. The toasted sesame roll, coated with mayonnaise, makes a convincing argument that I’m eating a normal mediocre sandwich, but the illusion only goes so far. The ham sits there limp, overwhelmingly sweet, and grossest where it is piled thickly in the middle. The American cheese is gooey in the manner of something that has sat out too long at a picnic. Nothing about it tastes naturally occurring. I want to tell the cashier she was right, I didn’t want this, but it’s too late. In fairness to Burger King’s relentless campaign for this monstrosity, it is reminiscent of the ’70s, just not so much the groovy disco party ’70s as an era of more-relaxed food safety laws, like it’s been made by undersupervised children with access to a fridge full of highly processed ingredients. If you’re nostalgic for, say, your parents’ divorce or your grade school lunchroom, this is the retro sandwich for you. When I leave, I beeline for a Duane Reade. For the record, Pepsi can wash away a lot of sins, but not the ones the Yumbo leaves in your mouth. 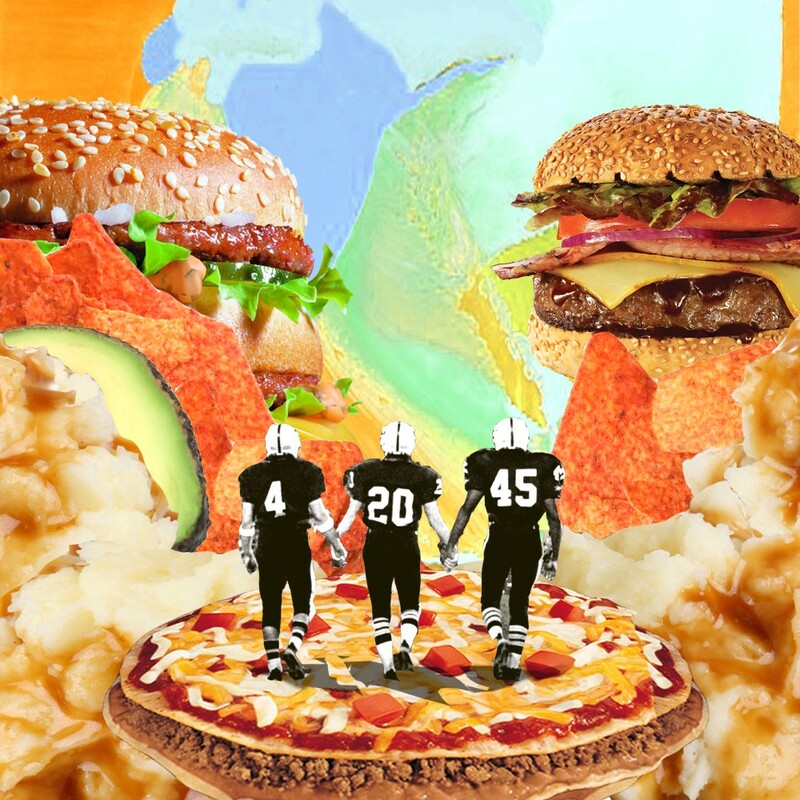 I tell a friend that I’m doing a story where I eat all of the food advertised during the NFL playoffs and ask if he’ll join me for dinner at Applebee’s. He texts back, “This is a really horrible thing you are doing,” but agrees to come when I offer to pay his cab fare. We meet in Times Square at what a neon sign outside informs me is the largest Applebee’s in the world. Now I am going to say something crazy about the Applebee’s in Times Square. It’s something that goes against almost everything I thought I knew about New York City and myself. Are you ready? The Applebee’s in Times Square is a revelation. We are seated immediately, everyone who works there is Care Bear friendly and super attentive, my Budweiser is enormous, and when they bring the chips and salsa we order, the chips have clearly been warmed under a broiler. Swoon. Doing this story in January when Applebee’s is promoting its health-conscious pub diet rather than the regular season when it was all crosscut ribs all the time feels like a mixed blessing. On the one hand, the chicken and steak we order look exactly like the dishes in the commercial, and I don’t want to overstate things, but they are made from mostly identifiable ingredients. Nothing about them is actively gross. On the other, the ribs that go out to other Applebee’s patrons look absolutely horrific. But that was supposed to be the point: I wouldn’t go to Disney World when Space Mountain was under construction, and I didn’t come here for the NFL’s clean-eating revolution. Can someone explain the Dunkin’ Donuts marketing strategy to me? I may not be the biggest fan of cream-filled, glazed sugar bombs, but the company has “Donuts” in its name, and if you are looking for a weapon to murder a diabetic with, everything in the store’s bakery case has earned its spot on that shortlist. So it makes zero sense that they insist on flaunting their revolting savory offerings on giant posters and nationally broadcast commercials. And if you have a food stylist at your disposal, is this really the most enticing you can make a breakfast sandwich look? This was my biggest fear: the Dunkin’ Donuts turkey sausage flatbread. They call it healthy, but they also pay Eli Manning to be the face of their company, so we’re already dealing with some trust issues. I am filled with dread when I order, and queasy by the time I unwrap the sandwich to find an English muffin. I bring it up to the counter and ask the cashier if this is the flatbread. She looks at it briefly, then at me, and answers, “No.” We both stand there, and it’s sort of like how on TV, no one says goodbye before they hang up the phone, but both parties know the conversation is over. I return to my table. Underneath the English muffin, the egg patty has a plasticky coating and a bright yellow splotch at the center that is about as convincing as a sign that says “Yolk goes here.” The turkey sausage is graying, the cheese vaguely radioactive. A sign at my table bears the slogan “Taste you can actually taste,” and it reads like a threat. The anticipation is the worst part until I bite into it, and then everything is the worst part. It is like a simulacrum of an egg sandwich, mysteriously spongy with a chemical flavor. By the time I get to the yellow center, I’m gagging. I try adding ketchup, but the sweetness isn’t doing the thing any favors. In the end, I am saved by the hash browns I ordered on the side. Maybe it’s just in contrast to the main event, but these are actually super enjoyable— oily, salty mini-latkes some embarrassingly trendy gastropub could serve. I switch from alternating bites to just putting the hash browns on the sandwich, and with something that’s not actively foul to bite into, I finish it. My heart aches. This is the meal when I cry. I am the least hungry I’ve ever been, I still want to barf from that breakfast sandwich, and for the first time since I quit five years ago, I regret that I no longer smoke weed. Despite having ordered the turkey and the Monterey Chicken Melt on different breads, selected different cheeses, and topped each with different condiments, I find that the easiest way to tell them apart is that the turkey one smells like turkey. I pretend the apocalypse happened and this is the last food on the planet and it makes the tears worse. I go to the gym immediately following lunch, and it is a debacle. I feel like my whole body is made of crumpled-up newspaper and fortified by iceberg lettuce. I’d wager the contents of my wallet that no athlete on Subway’s payroll has ever tried a Subway sandwich, but I can’t imagine anyone would even take that bet. The cab driver who takes me to Crown Heights to pick up my order tells me he could really go for some pizza. I start to list his options, and I hear panic in his voice when he says, “Plain. Just plain.” I don’t disagree. As far as I’m concerned, pizza and soft pretzels are both on the snack table the gods sit around when they decide what miracles to send down to earth, but they’re not eating them at the same time. I cannot blame this pizza for the wounds of my past, but three hours and an unsuccessful workout is not enough distance between me and two Subway hoagies. I’m just not ready to open my heart to new and experimental foods. It’s not you, flavored crusts, it’s me. I don’t let my belly full of baggage stop me from trying. The crust flavors are less taco-wrapped-in-a-pizza-deep-fried-and-smothered-in-chocolate than I was expecting, and more like the standard Pizza Hut product you remember from your childhood but with pretzel salt around the edge. Even the honey sriracha is essentially just pizza coated in hot sauce with a few nauseatingly sweet patches. But if your thing is outrageously repellent fast food creations, the Triple Cheese Stuffed Crust is tailor-made for you. The commercial makes the nonsense yet still terrifying claim that “only Pizza Hut gives you your cheese pizza covered in cheese.” The ad fails to mention that the cheese stuffing the crust is cheddar. Apart from the criminal exploitation of fast food workers, this is the most offensive thing I encounter all week. Making it through the slice without vomiting is a triumph too sad to even celebrate. Everyone talks a big game about how much they love Chili’s, but when you ask them to go with you for lunch in Jersey City on a Monday, suddenly they’re all sooooooo busy. I invite my friend from Applebee’s, who declines, “Sorry, I treat my stomach like an unrelated minor: It’s a worse crime to abuse it after crossing state lines.” One friend has to work, but suggests I try a variety of complicated orders that each deliver over 5,000 calories. I email a pal who lives in Hoboken to see if she’ll come meet me. She writes back, “I’d love to, but I moved to the city yesterday!” I suspect she’s lying. So that’s how I find myself ordering tableside guacamole, a steak, a half rack of Dr Pepper ribs, and a side of fries for one. “Is that all?” the waitress says, without a hint of sarcasm. I brought a book in anticipation of dining alone, but this is America, and lest I question the life choices that have delivered me here or feel bored for even a minute, Chili’s has furnished my table with a tablet from which I can order drinks and desserts or, for a 99-cent fee, play games. I opt for trivia because, duh, put my name in as “Fatty,” and start killing it on clues like “Iconic style setter of Rebel Without a Cause” and “His final role was Plutarch Heavensbee in Mockingjay Parts 1 and 2.” After I answer that one correctly, the screen pops an interstitial: “Fun Fact: Hoffman passed away February 2, 2014.” So much fun! My guacamole arrives, and while the waitress assembles it, dumping pre-chopped ingredients into the mashed avocados, I ask if it is different from the regular guacamole. She was not lying, though: This guacamole has definitely been made with avocados, and was it really only Friday that I last ate an uncooked fruit or vegetable? Food from the earth is divine. For that matter, so are ribs basted in Dr Pepper. I get that this is a thing Texas pitmasters have been doing for forever and hipster chefs have been doing for a shorter but still long time and probably your dad at some point in the last two years was like, “You’ll never believe how I ate these crazy delicious ribs and there was Dr Pepper involved.” And fine, these are stringier and more syrupy than what you get from any of those people. Still, shouts to Chili’s for getting Dr Pepper ribs onto its menu and onto my table; I house the half rack, easy. This sirloin with grilled avocado is another story. It’s topped with a cilantro sauce I am heavy into, but the actual steak is gristly and only getting tougher as it cools (I keep getting distracted by trivia). At first, I’m excited by the salad, but it’s coated in some type of slimy dressing that renders it worthless to me. Smoked turns out to be the operative word with the potato wedges; I’m fairly certain these were cooked in the pocket of someone’s polar fleece as she sang folk songs next to a campfire. The fries are fries, which is to say I eat them happily, until I check my watch and realize my next feeding is fast approaching and I better save some room. It tastes like drinking a Yankee candle. I spill a little on my hand and it’s so sticky I want to cut my arm off. About a year ago, I started to worry I wasn’t actively appreciating enough things about my life in New York and made a promise to myself that I would eat at least one slice of pizza a week. It is among the smartest choices I’ve ever made. My love for pizza runs deep, and the joy it brings into my life on a regular basis is too great to quantify. I was a little concerned about staying true to my vow this week. Yes, I ate Domino’s and I ate Pizza Hut, and I sort of enjoyed them both, but they felt like eating Domino’s and Pizza Hut as opposed to eating pizza. Maybe it’s because I had a steak and ribs for lunch and can’t imagine stuffing anything else down my gullet, but I decide Papa John’s counts as my weekly pizza party. That said, if it’s your best option for a parlor slice, you have my deepest sympathies. I continue to neither especially like nor truly understand yogurt. Believe it or not, I’ve never eaten a Big Mac before, and on the day I decide to pop my cherry, a story about the secret torture experiment our government is running on livestock so that companies like McDonald’s can profit runs in The New York Times. I make it to the part about the “downed cow,” before closing the tab. A few years ago, on a weekend at my friend’s uncle’s farm, I helped slaughter a lamb and then dressed it and roasted it for dinner. I certainly didn’t love the experience (it probably didn’t help that I decided to take mushrooms while the lamb was cooking), but I can live with the whole “meat is murder” thing. In theory. In practice, I very rarely kill my dinner, and the cruelty and environmental destruction inherent to the farming industry don’t sit so well with me. 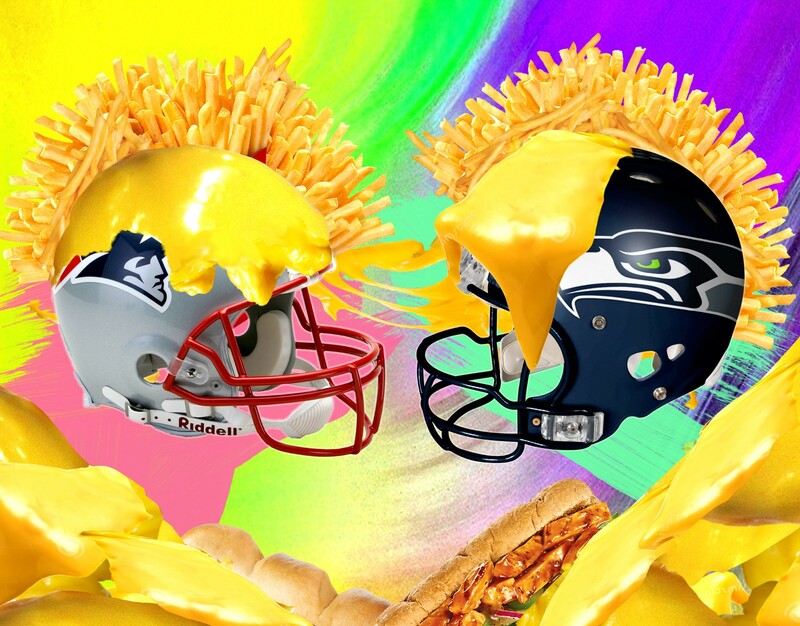 NFL playoff cleanse aside, I am about 75 percent vegetarian. One reason I don’t kick meat entirely is that I really, really love cheeseburgers. Specifically, the fat, juicy ones formed by human hands and cooked on an open flame. Not to be too John Kerry on a windsurfer about it, but after I eat the Big Mac, it’s just like, really? We have to run animal concentration camps so I can eat this? I am pretty sure I’ve had meat substitutes that are more beefy. Other than the personal guilt, the Big Mac is easy to finish, and I move on to the rest of my meal. I have a love-hate relationship with mozzarella sticks, which is to say when I order them, I usually love the first one, joylessly eat the rest, and then hate myself. Most mozzarella sticks are best enjoyed when they’re burning the entire inside of your mouth and then never again. McDonald’s takes a totally different approach. Extremely thick bread coating, room-temperature cheese-product filling, no elasticity whatsoever. If I were a Yelp user and they were served to me in a bar, I would give that bar zero stars. At least there are only three of them. And then there are the fries. What can you say about McDonald’s fries that hasn’t been said? They are a nearly perfect food, and until we can figure out a way to free ourselves from the evils of American corporate greed, let’s all enjoy the bejesus out of them. According to my carefully mapped-out meal plan, I am ordering Taco Bell for dinner. 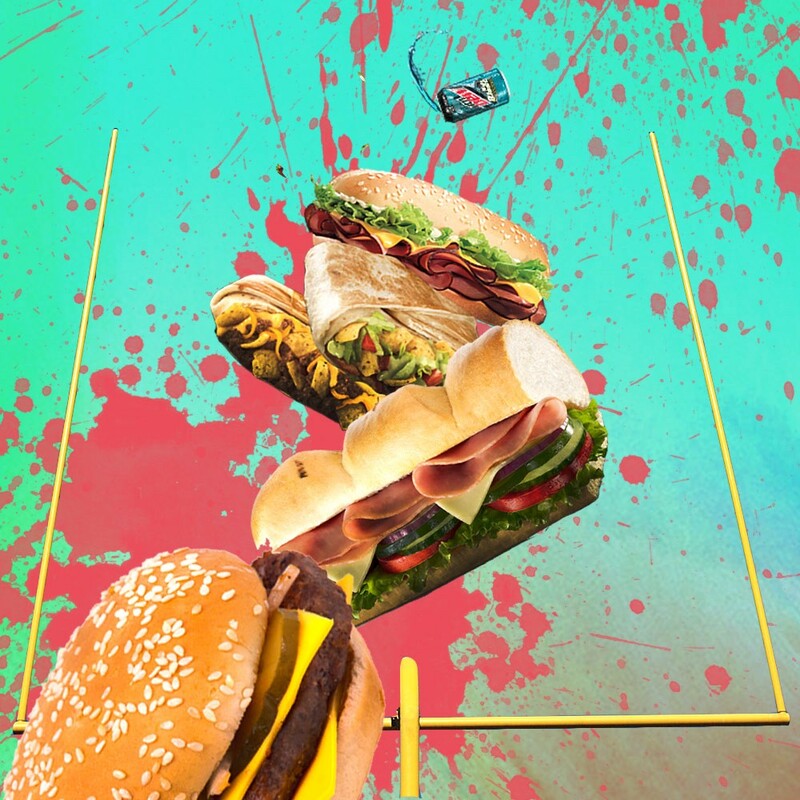 I download the app and am immediately confused, not so much because it’s hard to use, but there is a weird Instagram aesthetic that just does not jibe with what I know to be true about Taco Bell. Plus, I keep thinking about the downed cow, and when I see the word steak, my stomach turns. I quit the app and walk to KFC. Frankly, I’ve been eagerly anticipating this stop. I will concede that Popeyes is better (and so is Crown, and so, probably, is your Chinese takeout spot with the pictures on the wall), but KFC was my original fried chicken love affair, and you never forget your first. Every place I’ve been so far has been bright and clean, but the combination Pizza Hut/KFC in Midtown is grime central. I descend to the basement level seating area with my meal; this is the room where people in horror movies get chained to radiators. I half expect to have to fight a rat for my chair. Just in case I needed a reminder that I’m eating someone’s science project, the drumstick and thigh I ordered are preposterously, disgustingly large. After my first bite, I feel as if someone poured cooled oil from the deep fryer all over my face. The dried-out biscuit absorbs the grease as well as all the other moisture in my mouth. Shockingly enough, the best thing on my tray is the crust of the pot pie. It’s thick, buttery, flaky, and totally ruined by the prison-cafeteria mystery mixture it’s encasing. I regret looking forward to this meal. I regret everything bad I’ve ever said about salad. Yo, Skittles are tasty as hell, and if you haven’t had fresh produce in a while, you can tell yourself they count as a fruit. I take issue with Taco Bell’s assertion that the problem with eating breakfast on a crowded train is that you might fall on someone rather than the fact that it’s so gross even the MTA shames riders who do it. Beyond that, I’m not mad at this thing, which is basically just a breakfast burrito that subs a hash brown for beans. Honestly, more burritos should do that. At first my Taco Bell breakfast sat in my stomach like a normal heavy brunch, but then it widened the scope of its occupation. By early afternoon, I’m sweating through my shirt, I seem to have developed the type of B.O. that makes people explain puberty to children, and I would prefer to never eat again. I whisper, “You like Wendy’s, you like Wendy’s, you like Wendy’s” under my breath as I wait on line behind a woman in a Juice Generation uniform. “You hate juice,” I add. These two sandwiches are 100 percent not meant to be ordered together: The nearly $6 asiago ranch chicken club is made with something at least closely resembling a chicken breast, while the Monterey ranch one is built around a patty from the extended chicken family. Instead of focusing on the unsettling difference, I try to figure out how Monterey Jack got its name. I look at photos of Monterey on my phone, and they all remind me of a spa. A spa where you’d order green juice. I’m pretty sure I’d commit a felony for some green juice right now. I don’t know who I am anymore. 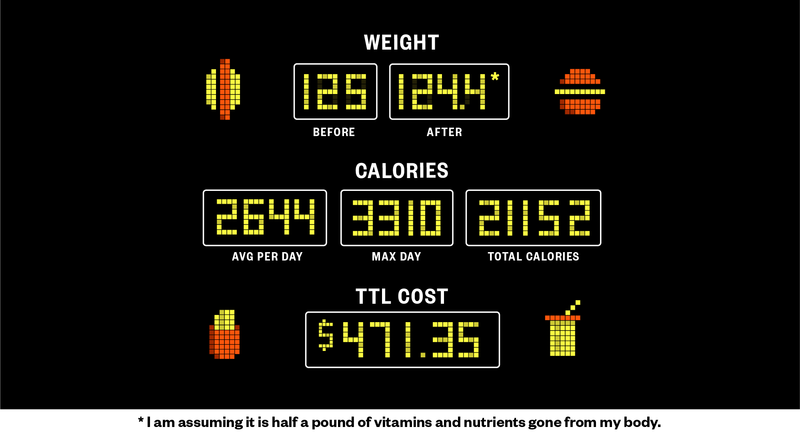 About a week before I started this diet, I saw a Sanjay Gupta segment where he talked about how Americans are all dehydrated and it’s why we eat so much — we’re walking around thirsty, but we think we’re hungry. I grow so sickeningly full from my lunch that I vow to stop drinking water. It helps not at all. For two crosstown blocks on my way to dinner, I try skipping instead of walking in the hopes it will increase my appetite. I have to stop when I get cramps down both sides of my abdomen. At Fridays, I meet friends, including an editor from a fancy food magazine who told his colleagues he couldn’t eat test-kitchen leftovers because he was saving room for dinner at Estela. “The lighting in here is a little unflattering,” he says as the host leads us to our table. The $10 Dine and Drink menu is nowhere to be found; when we ask our waiter, he has never heard of it. Upon further investigation, he informs us it is only available outside of New York City. In the spirit of the exercise, we do our best to order the same dishes at their normal inflated prices. I think my brain function is declining; matching items from the menu on my phone to the one in front of me is exceedingly difficult. I can’t find the Light Blackberry Margarita, so I order something called a Pink Punk Cosmo because they both sort of have colors in their names and sound like something a Bratz doll would drink. I get carded by the manager (I’m 30 and look it), but this is less surprising than how the primary component of the Pink Punk Cosmo is cotton candy, over which the waiter pours vodka and cranberry juice. He brings lemons unrequested, explaining some people find the drink too sweet. Those people are correct. “It’s more of a spinach dip,” one of them says. “Yeah, but this pasta is whole wheat. This food is made from ingredients. 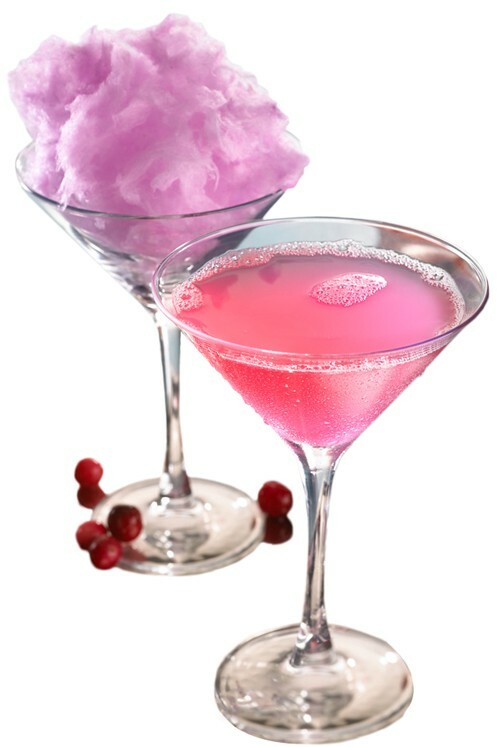 I feel like it’s gonna be okay.” I take a sip from my liquid cotton candy; it makes my teeth ache. Egg McMuffins are an A+ cure for a Pink Punk Cosmo sugar hangover. “I’m worried you don’t seem crazier,” is what my editor says when I describe my last few meals. We’re in a combination Taco Bell/Pizza Hut, where I am going in on some Crunchwrap Sliders. I don’t tell him that last night I dreamed I was ordering from the Taco Bell app and in the morning I had a brief moment of panic that I’d made the Gregor Samsa transformation into a chicken nugget. 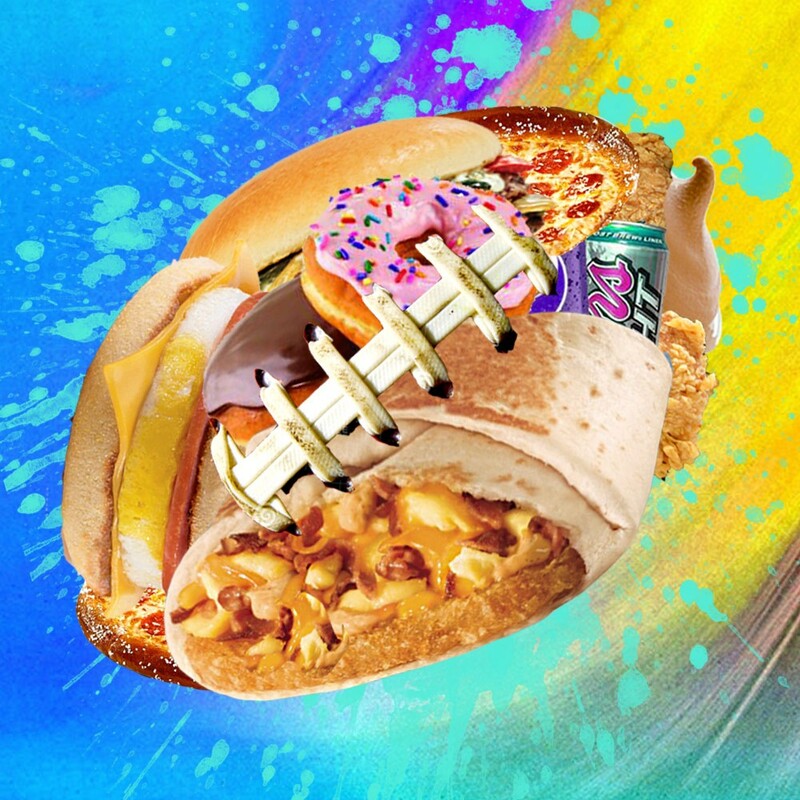 Despite haunting my nightmares, Taco Bell kind of has this fast food thing figured out. For one thing, can you think of a better name for a product than a Crunchwrap Slider? Like, everything about it sounds delicious, yet it’s impossible to visualize — probably by design, since it looks like a misshapen frozen burrito. Taco Bell knows what you think about its meat, and it will mix the meat with Fritos and cheese so you can at least pretend you never heard all the urban legends when you were in middle school. But Taco Bell’s crowning achievement is the Mountain Dew Baja Blast Freeze, aka a Slurpee I don’t realize is caffeinated until later that afternoon when the puberty sweats return and I begin talking at a rate my coworkers find alarming. I don’t even care. Team Baja Blast Freeze 4 Lyfe. I’ve grown rather fond of the 24-hour McDonald’s across the street from my office — exhibit A: the drive-thru window that opens to the sidewalk with a “walk-up” sign above it — so I keep it civil when the cashier tells me they’re out of the apples I’ve purposely held off ordering before this visit. “No, thank you. I’ll have fries. And an ice cream cone.” I try to remember what hunger felt like. Because this is my third meal here in as many days, at first I’m unfazed by the man screaming into his cell phone about his plan to push his brother-in-law off the Staten Island Ferry. I don’t even notice that he’s approaching until he throws a package of socks on my table. If McDonald’s has any sense, they will institute a livestream of this hero: a living, breathing distraction for anyone who would like to forget she’s shoving two dinners and dessert into her face simultaneously. You don’t need me to tell you what Cheerios taste like, but I will say they are a food for babies. Subway is my Snowpiercer protein block; it’s vastly better than eating human body parts, but it’s a great injustice that only a privileged few have access to Wawa hoagies. Normally I don’t like queso because it reminds me of the terrible Tex-Mex restaurant I worked at during college, but today I don’t like queso because it is room temperature and gross and also I can’t stop eating it. Snack addiction is real, y’all. There is nothing left for me to do but use the Taco Bell app. The commercial claims there are millions of combinations, which seems mathematically questionable to me, and also beside the point: Everything it offers is a standard menu item, not some secret snack only experts who review food on YouTube know about. The whole point of a chain restaurant is a very narrow range. Taco Bell can front like there are no limits, but all a franchise does is work with budget ingredients, a tiny or nonexistent kitchen, and detailed product specifications. When they make a taco out of a Dorito or a waffle or whatever, they want the unholy union to make headlines, but they also need the resulting product to be very similar to their existing simplified offerings. While there’s some appeal in always knowing what you’re going to get — and in anything made out of a Dorito — only consuming meals that make the journey from freezer to deep fryer robs food of some of its pleasure (not to mention nutrients). It pains me to admit the pretentious a-holes living the Goop life are right, but vegetables make life better. 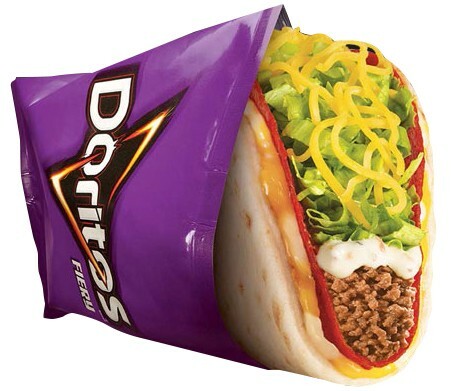 So the Fiery Doritos Gordita Crunch tastes like the other gorditas I’ve eaten in my lifetime (so, delicious), but with a different powder on the taco shell, and after one bite I realize I am eating the Crunchwrap with less cheese and no Fritos. I’m running late for a dinner party where, despite being stuffed with Taco Bell, I will go HAM on some brussels sprouts simply because they are green, so I take the Mexican pizza to go. Walking down to the train, I see a man going through the trash can. I ask if he’s hungry and offer my leftovers, even more disgusted with myself for the staggering quantity of unwanted food I’ve consumed. He says thank you and takes it. But then he looks in the box and throws it away. 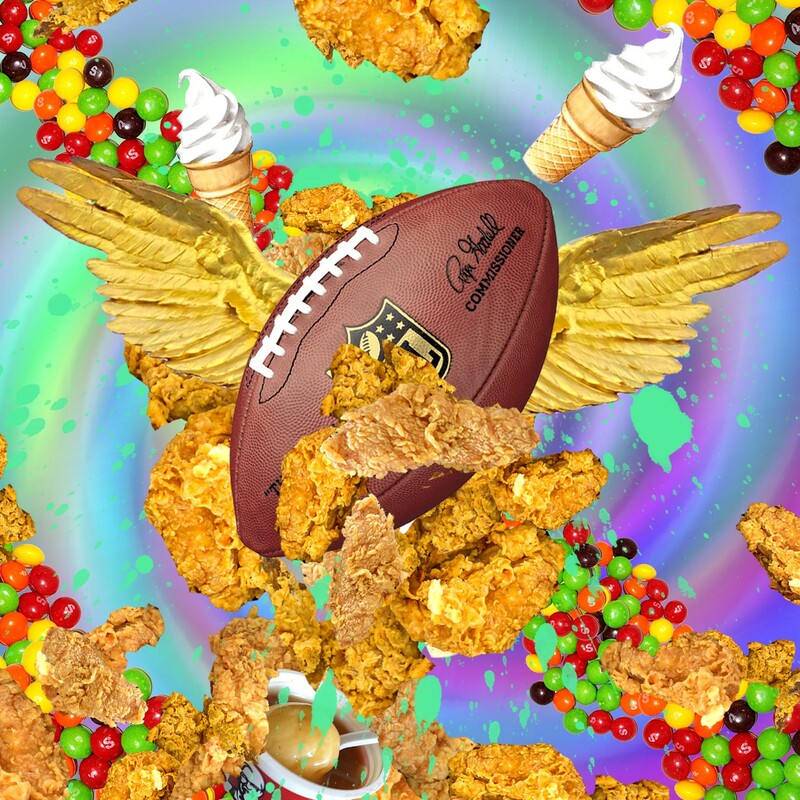 My week on the NFL cleanse, by the numbers. 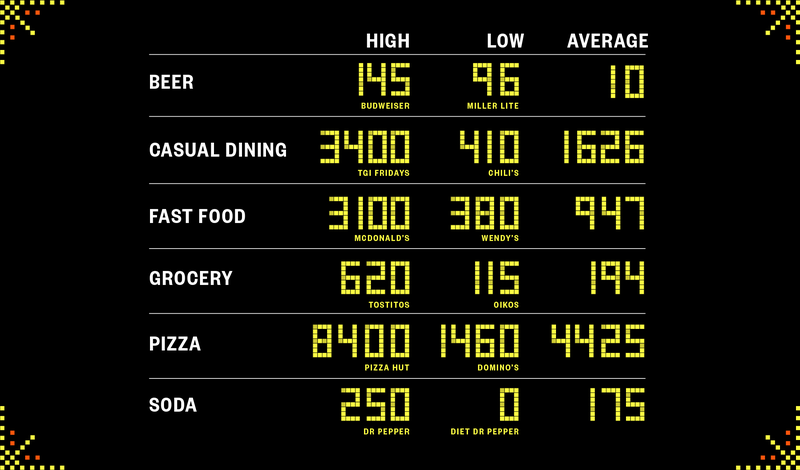 Check out the calorie counts for food commercials that aired during the playoffs, broken down by category and chain.